Midnight navy blue v-neck short-sleeved shirt with large geometric mesh shapes covering each breast and a row of two smaller mesh diamond shapes below each breast, aligned diagonally away from the central torso, with a third underneath. Knitted black sleeves running across the shoulders up to the collar and across the reverse, below the collar, with navy and black striped cuffs. Navy blue stripe around side and back of collar. Thick black side-seams, with turquoise pin-stripes, running down inner sleeves right to the hem. ENGLAND in black capitalised lettering on a navy panel across the back of the collar. Embroidered turquoise emblem on left breast, with a turquoise border, a silver background and a turquoise star above the emblem. The opponent's name in capitalised turquoise lettering below the emblem and the date in turquoise below the opponent's name (e.g. 1 SEPTEMBER 2017). White Swoosh on right breast, turquoise number in centre of chest and on reverse, in same font as the previous kits, with a white border. White emblem at base of each number on reverse. Surname in capitalised turquoise lettering above number on reverse in same font. Rectangular black label on left hip with AUTHENTIC in large silver capitalised letters, with two silver lines underneath, followed by a nine-character serial number in silver below, all within a silver border occupying two-thirds of the left-hand side of the label. Remaining third comprises a black Swoosh, with a black line underneath, followed by 2017 in black below, all on a silver background of interlocking diamond shapes. DRI-FIT in capitalised white lettering embroidered onto right hip. Navy blue shorts. Thick black seams, with turquoise pin-stripes. DRI-FIT in capitalised white lettering embroidered onto right hip. Turquoise number on left thigh, in same font as on shirt, with white Swoosh underneath. Embroidered turquoise emblem on right thigh, with turquoise border and a silver background. Navy blue socks with a white Swoosh on shin. 32 turquoise lines on back of calf, getting progressively shorter after the first 16, mirroring the shape of the calf muscle. The central section of each line is a thicker and brighter turquoise, apart from the lowest four lines which are made up only of the thinner and lighter turquoise. England's captain, Gary Cahill wore a plain white armband against Germany in Dortmund. 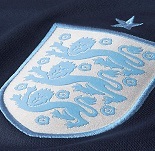 For the next two games, the captain wore a yellow armband featuring a black C.
The names of England's opponents, as they appeared beneath the emblem, were GERMANY and MALTA. Against Malta, England had the QUALIFIERS FIFA WORLD CUP RUSSIA 2018 logo on the right sleeve, and the European Qualifiers and UEFA RESPECT logos on the left sleeve. Dele Alli wore his forename (DELE) on the back of his shirt. Alex Oxlade-Chamberlain only included his paternal family name (CHAMBERLAIN) on his shirt. Livermore was only twelve minutes short of three full games in the shirt, though he was substituted twice. Seven players made their international debut in this kit, all against Germany (two different games). Nathan Redmond wore it for just 25 minutes (plus three minutes of added time). Bertrand's was his only international goal. Cahill captained England for the fifth and last time, against Germany in Dortmund. Dier captained England for the first time, against Germany at Wembley. 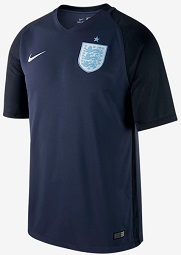 Released on 20 March 2017, this was England's third kit in the Vapor design. Uniquely, following the absence of blue in the last Umbro kit, in 2012, this outfit was completely devoid of red, with even the emblem getting a turquoise and silver makeover. It briefly appeared in 2017 for three games, possibly just to keep the replica-buying public occupied in-between major releases. Navy blue wasn't really ideal as a second choice, because the home kit had blue-grey sleeves, so when the Scotland game came around, they had to revert back to the red kit from 2016. England then introduced a new red kit for the 2018 World Cup. England: Jordan Pickford, B.Holgate, Ben Chilwell, N.Chalobah, J.Stephens, A.Mawson, D.Gray (Ruben Loftus-Cheek). Harry Winks (J.Swift), Tammy Abraham, L.Baker, J.Murphy. England: A.Gunn, Joe Gomez, S.McQueen, W.Hughes, R.Holding, K.Hause, S.March (D.Gray), J.Swift, C.Woodrow (Tammy Abraham), Ruben Loftus-Cheek, J.Murphy (J.Grealish). England: Jordan Pickford, B.Holgate (Ja.Murphy), Ben Chilwell, N.Chalobah, Calum Chambers, A.Mawson, J.Swift (D.Gray), James Ward-Prowse, Tammy Abraham (C.Woodrow), L.Baker, Nathan Redmond. The Under-21s' shirt did not display match details beneath the emblem, but against Slovakia they wore the tournament logo on the right sleeve and the UEFA RESPECT logo on the left sleeve.